Christopher Jones and Hi-Fi instantly transplant readers into the 1970s in this first issue’s opening pages. A succinct recap page lets readers know that The Doctor and Jo’s adventures are taking place just after “The Three Doctors” serial. That means The Doctor has a full working TARDIS. The story pacing of this issue feels much like a classic Doctor Who serial. The beginning story is spent on personality building of the various characters: Jo and Captain Yates and dinner, Brigadier Alistair Gordon Lethbridge-Stewart mobilizing UNIT for an unexpected alien encounter, and of course the Doctor rubbing elbows and dazzling movers and shakers. It’s a build-up that reveals The Doctor’s greatest nemesis is secretly involved. Through-out, Paul Cornell laces just a few words with each character that makes fans of the television show feel at home. From having The Doctor nickname Pol Pot, to asking the Brigadier if anyone had bothered to try talking to the invading aliens, Cornell’s love and understanding of the property shines. For those who do not know Cornell is a staple in the Doctor Who fandom, not only writing numerous books but also several episodes of modern Doctor Who television and audio dramas. At one point, Cornell’s dialogue sings with The Doctor chiding The Brigadier and The Brigadier being very self satisfied with his military might. They are the jolly, yet meaningful interactions that leave you feeling like you just watched a classic episode. Hi-Fi’s bold and bright color pallet work well to express the liveliness of the time period. Combined with choice shading that leaves you feeling like each page is a complete package, Jones and Hi-Fi’s art work so well together. One challenge that his hard to tackle in Doctor Who are the bits of conversation between the Doctor and companion, while attempting to problem solve. It can easily turn into a stream of speech bubbles. Lots of the Doctor who comics work around this by having the characters moving from one location to another (usually running) while talking things out. Here, there is a great choice in how panels are separated during these long conversations. Not only is their action, thanks to Bessie, but also a clear understanding of reading order. At one point a gutter is used to help you read everything in order. It wasn’t until my third or fourth reading of the comic that my brain became aware of what had been accomplished. They were such simple panels and yet did so much in a small amount of space. Titan Comics has really stepped up with game with all of their choices for artists these past few years. 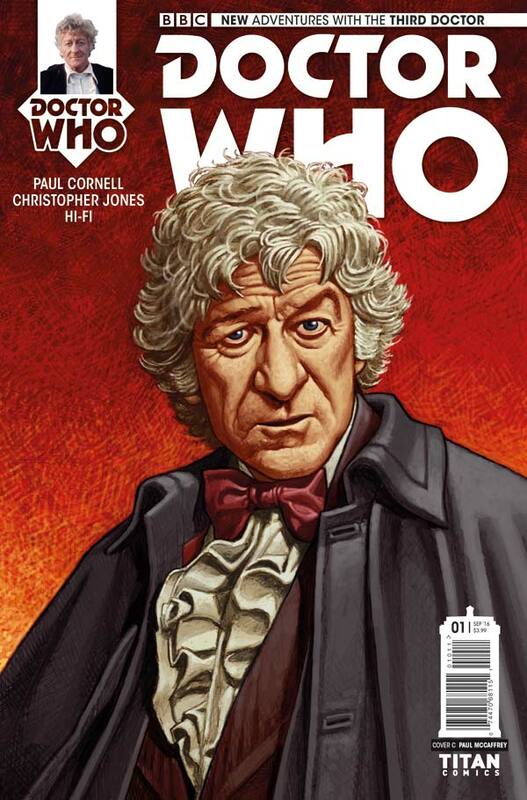 This book is yet another brilliant example of bringing Doctor Who fans high quality creative teams. It clear through their work that they care deeply for these characters. 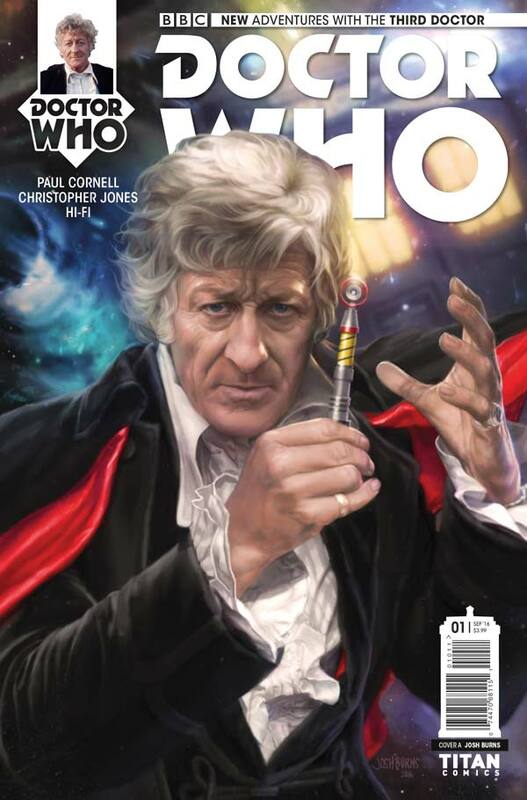 For a full sense of wonder, enjoyment, and hearing the characters just right in your head, it does help to have seen some of the Third Doctor’s adventures from television. This is especially true, when a mask is literally pulled off, and a great enemy of The Doctor is revealed. Without watching Third Doctor adventures, or doing some googling, readers would be clueless to his identity. However, the general action and adventure can just as easily amuse and tickle the fancy of any comic reader or Doctor Who fan.